A Follow Spot: Anticipating Sunday: What's on Telly? 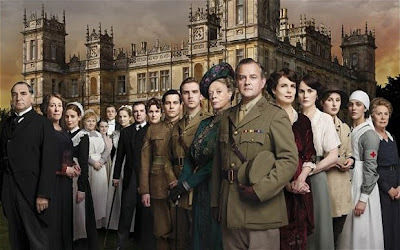 Just a quick reminder that the holiday lull is over, and my two favorite dramas -- the gorgeous "Downton Abbey," which lovingly creates the post-Edwardian years in England for PBS's Masterpiece, and the equally gorgeous "Once Upon a Time," with its dual fairytale and real-life worlds populated by people like Snow White and Prince Charming -- return this weekend. The second season of "Downton Abbey" begins Sunday evening at 8 pm on WILL or WTVP for central Illinois TV fans. We haven't seen new episodes of "Downton Abbey" since last year, so Sunday will be a red-letter evening for anybody who got hooked on the adventures of the aristocratic (as well as tempestuous) Crawley family and their (equally stormy) staff. This year, we'll be moving into World War I (see uniforms above) as the Crawleys deal with war and major change on every side in addition to thwarted romances, inheritance drama, secrets and lies. To get you in the proper mood, PBS has supporting materials and last year's episodes streaming here, even including a quiz so you can figure out which member of the estate is most like you. "Once Upon a Time" has only been gone since December 11th, but that was a shocker of an episode that killed off the sheriff in Storybrooke (the real town that sits on the ruins of the cursed fairytale kingdom) and showed just how evil the Evil Queen/Mayor Regina really is. 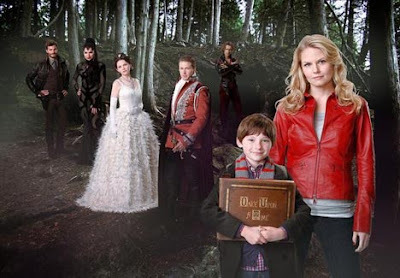 Our first episode of the new year is called "Desperate Souls" and purports to involve the campaign to replace the sheriff, as our heroine Emma Swan, the town newcomer who we know is the key to reversing the curse takes on Mr. Glass, Storybrooke's newspaper editor, who is the Magic Mirror in the world of fairytales. Glass/Mirror, get it? One of the most fun things about the show is deciphering who the residents of Storybrooke will be in fairytales based on their names. The "Desperate Souls" episode airs at 7 central on ABC Sunday evening. Which means you can watch both "Once Upon a Time" and "Downtown Abbey" without missing a beat.